Northern Ireland in January is again on a slippery slope as the highest prices in the UK for unleaded petrol at 133.2 pence per litre and also the highest price for diesel at 140.6 pence per litre have been recorded. 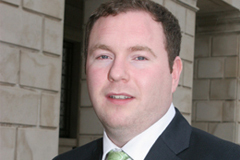 South Down MLA Chris Hazzard has called on the British government to intervene over high fuel prices in the North. As the recession continues to bite, this is not good news for local businesses and commuters. South Down MLA Chris Hazzard has called on the British Government to relax the tax on petrol and diesel after the latest figures show fuel prices in the North as some of the highest in Europe. Mr Hazzard said: “Fuel users in the North of Ireland are being penalised by high fuel duty imposed by the British Government and they must act to reduce it if the North is to be sustainable on a competitive basis. “Most business have a transport cost as do most people and the high prices at the pumps are putting people under undue financial stress because the tax imposed by the British Government is so high compared to other nations. “Whether it is a commuter, a taxi driver, delivery driver or a major haulage firm, everyone of them are feeling the pressure and with further price hikes on the horizon many will be forced to close causing higher unemployment. Down News has calculated that the cost of petrol per litre in the North is 133.2 pence and 1.37 in the South but diesel is as high as 140.6 pence in the North and just 133.0 pence in the South. 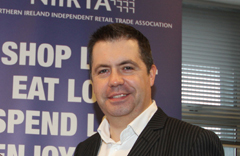 Glynn Roberts, NIIRTA Chief Executive, is concerned at the escalating fuel prices and the impact on local businesses. Commenting on a recent AA statement, the Northern Ireland Independent Retail Trade Association (NIIRTA) has supported their call for the Chancellor to cancel the proposed September rise in duty. NIIRTA Chief Executive Glyn Roberts said: “The staggering rise in the average cost of petrol in the last month is a cause of major concern to the local retail sector and we urge the Chancellor to address this issue in his forthcoming Budget.